Girls of Calgary: Did You See THESE Girls? More on the Calgary Stampede. You might find some of the Stampede history quite interesting as well. This tradition, which started with Patti Henderson as queen in 1946, thus bringing the Rodeo Queen concept to Canada. The Royal Trio concept helps reflect our civic pride in our western heritage. The successful Calgary Stampede ladies must meet some stringent requirements for this role. Anyway, more power to them. They have an important job as "goodwill ambassadors" of the Stampede, and they reportedly make over 400 public appearances during their one-year tenure. It's a tough job, but somebody's gotta do it. Hope those cowboy hats are good and durable. It's all fun. Any more girls of Calgary? See some photos of these on Google. Like these young ladies. Nonetheless, people often wonder about the Red Mile. Some of that crazy Calgary Flames Red Mile action along 17th Avenue SW has been captured and you can see it by typing "Calgary girls red mile" into the Google images search box. Some of these women became quite well known during the 2004 playoff run for the Calgary Flames. All hell sorta broke loose along the red mile section of 17 Avenue, leading from the Stampede grounds (which house the Pengrowth Saddledome, where the flames play) for several blocks westward. The strip features lots of bars and restaurants and resembles the great Electric Avenue, 11 Ave SW of the 1980's Olympic fever days to some degree. Drunken fans and other party participants made their way down the street, causing minor damage, fights and assaults, and public urination and other displays of body parts. All in all, though, it was minor when compared to similar events in other cities; there was no serious rioting or looting. The most talked about of offenses was jaywalking. Then there's the girls. 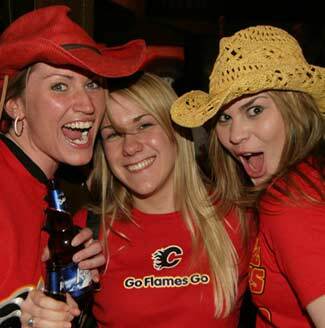 These incidents made the girls of Calgary somewhat legendary. If you're hunting for more explicit photos of the Calgary Flames red mile girls without any naked old men, alter the SafeSearch settings on the Google image results page to suit your needs. Anything that you have seen in Calgary that should be included on this website? Maybe you know something we ALL should know, or just have a great photo to share. You can, right here. We need a title for this. Anybody know who this cute girl is? Never make the mistake of visiting calgary now!!!!! Go back from Girls_of_Calgary to the Calgary Girls Party web page.